A couple of days ago Zach and Nophead independently came up with two important insights. Zach's was that, in order to make a granule extruder, you don't need a complicated auger to move the granules forward; you can just use a piston, like a syringe. Nophead's was that, if you want a tube that's hot at one end and cold at the other and strong you could use stainless steel (which has a very low thermal conductivity for a metal) and slap a heatsink on it at the point where you want it to go from hot to cold. This prompted me to sketch out the above design for a granule extruder. The extrude nozzle is on the left, made out of a brass fitting screwed to the 8mm I.D. stainless tube. We wrap nichrome heater wire round that and that end of the tube to cook them up (there would also be heat insulation round this section - not shown). A bit to the right is the heatsink, which gives the transition from hot to cold. Around here the polymer should go from a melt to granules. This phase boundary is important, because it is here that air bubbles get more-or-less automatically excluded. If we can easily get 8mm internal diameter stainless tube (anyone know where? ), we can just use a length of the standard 8mm studding that forms Darwin's frame as the piston. The piston stays cold at all times; when it gets near the melt region (detected by an optoswitch - not shown) it is retracted and a new charge of granules falls in front of it from the hopper. Recently Ian measured the force needed to push polymer through our standard 3mm filament extruder - it was about 10 N. This means that this device should need about 70 N to give the same pressure. The drive is a worm gear turning an M8 nut against a force transducer that measures that force. At the right hand end is a nut running in a hexagonal channel. This is soldered on the end of the M8 studding and stops it rotating. I think the whole thing needs to be horizontal rather than vertical (which might be mechanically simpler) because my earlier granule extrusion experiments showed that the mere convection of heat up the tube was enough to melt the polymer all the way up. But a simple experment with a heated tube and heatsink full of non-moving granules should show if it really does need to be horizontal. I'm off to the Go Open 2008 Conference in Oslo in a few hours to spread the RepRap word. I'm back next weekend, when - unless anyone can think of a good reason why this won't work - I might try to put one together. I'm also experimenting with a very very simple design for a field's metal extruder for electrical circuitry that's waiting for the transatlantic postman to lay some insulated nichrome wire on me from the RRRF Store. Watch this space for news on both when I get back. Regarding horizontal / vertical. I don't think convection can carry heat up the polymer because it doesn't flow fast enough. If you don't let air in the bottom there is non to rise up apart from that in between the granules. I think conduction through the polymer was you main problem, which would be the same horizontally as vertically. Always keep in mind that polymers are the worst heat conductors ever, and that they degrade rapidly when molten. This makes the hard-to-molten transition zone crucial. It is very hard to rapidly melt granules without burning them in a "dry" chamber (i.e. when no prior melt is present to promote heat transfer). 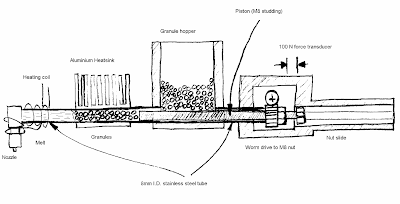 In a screw-based injection machine, the screw squashes the granules against the heated wall, with substantial extra heat being generated by the squashing action itself. You cannot count on any of this in a ram-based injector, and that's why such designs are considerably slower. Now, you want to build a continuous feed ram-based design? You'll probably just end up "burning" the resin. Personally, I would be tempted in a variation on the gear pump theme to feed the granules, fitted with a long barrel with progressive heating along it. How do you avoid air bubbles in this (and other granule mechanisms for that matter)? As you gently and consistently compress the granules, the air is driven out from the gaps - it exits though the un-melted granules. You create a carefully controlled temperature gradient along the compression chamber to ensure this happens correctly. You'll probably want to vary the compression speed too, as commercial screw-based extruders tend to use a variable-pitch screw to control the flow rate as the granules collapse. Oh, a little PC fan blowing sideways will remove convection problems and allow a vertical design. Can we please pick something with worldwide availability? 1)For larger amounts of extrudate the piston will have to move back and forth for extra loads of granules. I think this might lead to inconsistencies in the melted filament, binding of granules in the back stroke and other difficulties. 2) the heat sink will cost quite a bit of extra energy loss. 3) for the bubbles to escape there will have to be a gap between the piston and cylinder wall. Melt could escape up this gap. Could be made with a funnel and a pizeoelectric buzzer or one of those tiny vibrating motors from a cell phone. If the vibration carried down into the melt it should help release bubbles. Another alternative is to melt the stuff in a large pot and then pump it through silicon rubber tubing (which can be formulated for temps higher than your polymer's melting point) using the systolic pump currently designed for paste extruding. That wikipedia article only talks about gas driven fluidized beds but the same effect can be gotten from vibration alone. Hi I do not know if this would be of any help with the problem of using granules but the fab at home wiki has some pictures up that would seem to indicate that they have reached a solution for this problem. if you go to the page and take a look under Worm Driven Extruder there are 3 pictures that seem to contain a hopper for the granules and a ribbed melt chamber just below it. let me know if what you guys think about it, as it may be worth asking them for more information on how it works. Kyle_b, you might be on to something. I just checked out the documentation on the extruder, and it seems to do fairly well. On the horizontal vs. vertical issue, I'd opt for horizontal. Not because of heat transfer, but it should be easier for an extruder of this design to refill itself. Yes - I know about the fab@Home granule extruder. Indeed, I helped the Australian students who designed it. The problem is it needs an auger, which is tricky to make. I hope we can avoid that. The back-and-forth of the piston shouldn't lead to inconsistencies if it's done at a parking position between layers - we just purge the nozzle a bit after a re-load. Is not need to be made. WOOD AUGER BITS are not expensive on EBAY. The price for 24mm diameter /600mm length is £15. 12mm/600mm is £8.9 and 12mm/235 is £2.90.There are 12mm/110mm as well. The auger has the property of continuing feeding. That helps to achieve a small tolerance of the filament diameter.Wood augers bits on ebay are cheep and manny. If the retraction of the piston can stop the extrusion then can be use as normal RepRap extruder. Now I understand way is interesting. I think is worth giving a try. it will be tricky to stop the extruding right after new pellets are coming in. Perhaps a variable retraction rate will solve the problem.